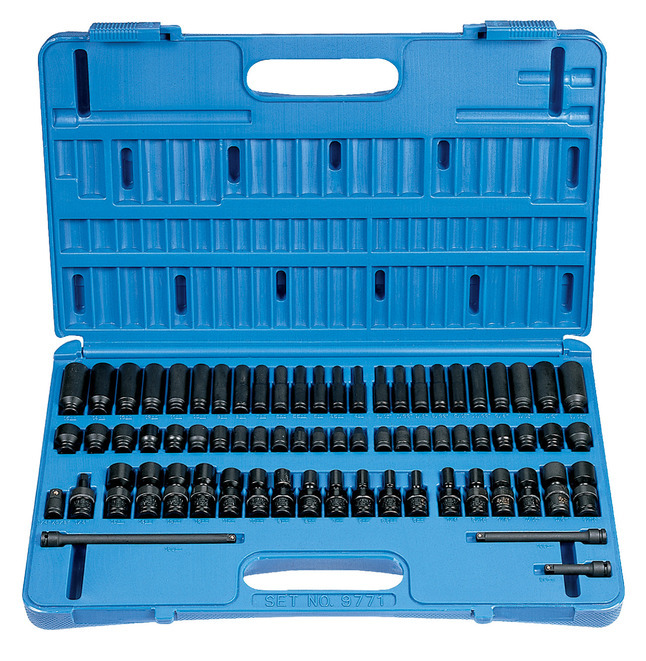 Grey Pneumatic 1/4 in Drive Master Set of 71 pieces contains every socket in our 1/4 in surface drive along with 3 extensions, universal joint and 1/4 in to 3/8 in adapter in a molded storage case with handle. 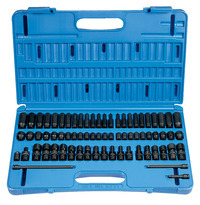 Set is specifically designed for use on impact wrenches, air ratchets and hand ratchets. Set contains deep and standard sizes 3/16 in, 7/32 in, 1/4 in, 9/32 in, 5/16 in, 11/32 in, 3/8 in, 7/16 in 1/2 in, 9/16 in 4 mm, 4.5 mm, 5 mm, 5.5 mm, 6 mm, 7 mm, 8 mm, 9 mm, 10 mm, 11 mm, 12 mm, 13 mm, 14 mm, 15 mm with 2 in, 4 in, 6 in extension. Set also has 1/4 in F x 3/8 in M adapter and 1/4 in x 1/4 in universal joint, 1/4 in, 5/16 in, 3/8 in, 7/16 in, 1/2 in, 9/16 in standard universal along with 5 mm, 5.5 mm, 6 mm, 7 mm, 8 mm, 9 mm, 10 mm, 11 mm, 12 mm, 13 mm, 14 mm and 15 mm.